IBAN STARS: Inochi (left) and Freddy will meet fans this weekend. 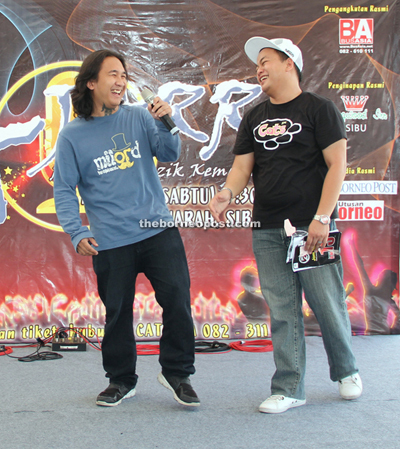 KUCHING: The Anugerah Juara Rentak Ruai (Ajarr) promotional tour will rock Sibu today (May 5) and tomorrow. The awards will unveil the best and most popular Iban song for last year. The preview at Wisma Sanyan is set to attract a massive crowd as Sibu folk are among the biggest supporters of Iban music. 2010 finalist Stevenson and Eddie Kuwing. Cats FM personalities Ijau, Freddy, Fuzz and Wayne will also meet fans. The main sponsor is Perodua Sdn Bhd, while Hotlink is the co-sponsor. Ajarr 2011 T-shirts and posters will be on sale at Cats FM counters. Meanwhile, organiser Cats FM said over 90 per cent of Ajarr 2011 tickets have been sold. It will be held on May 12 at the Sibu Civic Centre. Tickets are available at preview venues, Cats FM office and Bus Asia counters in Sibu. Limited tickets priced at RM50 and RM30 are still available. Twelve songs will compete for Ajarr 2011’s Most Popular and Best Song awards. Fans can vote for the Most Popular award by sending AJ <space> name of artiste to 33080. For more information, go to www.catsfm.my or the Facebook page.